My apologies for the lack of posts these past few weeks. I've always heard that burnout was a thing, but I don't think I have really experienced it until now. 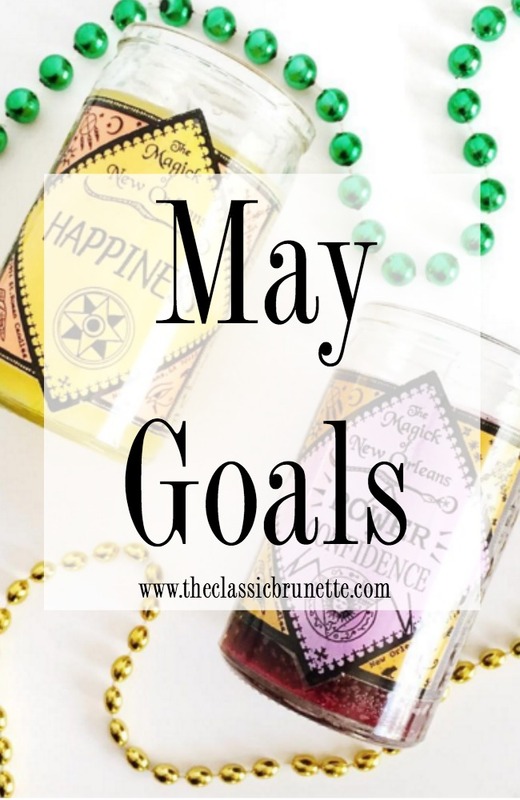 My finals week was especially crazy and some things just did not go as planned that week which left me overstretched and overstressed with all the things I had to do. I also had to drive up from Orange County by myself so six hours of driving after a stressful week didn't exactly help the situation. I've decided to take most of the week to rest up and just take some time to do as little as possible. Obviously I still have some things that need to be done, but for the most part I'm just regaining my sanity from the past crazy weeks. Moving on to today's post, I was really excited when Luminess reached out to me again to try their new product Air Supremacy! If you've been reading my blog for a while, you may have seen my last post with Luminess on their Airbrush Foundation and how much I loved it. I know I'm not the only one who gets acne when they're stressed, and although I'm lucky that I only get a few red spots, they do still bother me. I luckily got to try Air Supremacy just in time for my red spots to come out during finals and it worked so well! I was sent two foundation shades a blush, and a blending brush/sponge. I was grateful they included two different shades because I actually did end up mixing the two while applying it. It seems like such an odd concept to spray makeup onto your face, but it's actually so much less of a hassle than applying it with a brush. I'm not the most experienced with foundation, so literally spraying on my face makeup makes the process so much easier! All you have to do is spray about 6-8 inches away from your face in a circular motion and bam, you're done! You can layer on as much coverage as you want by just spraying on some more in certain areas. It took me less than 3 minutes to apply and I used the sponge to blend it a little so it looked more "airbrushed." Here's the before picture. 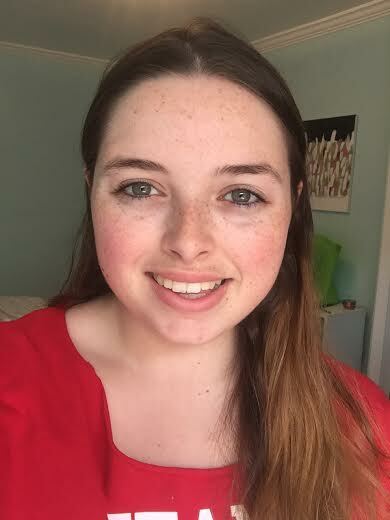 I have no makeup on whatsoever and there are things that I would love to have covered up including the little red spot on my chin, my freckles, and my flushed cheeks. Here's the after. 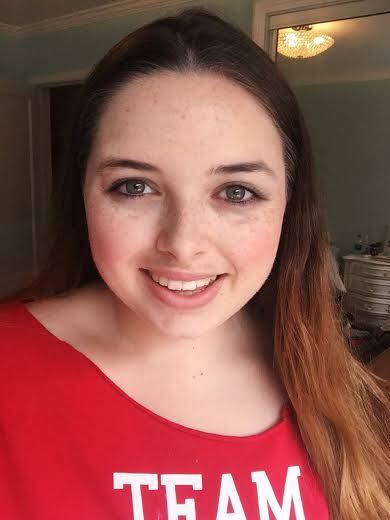 My freckles are covered better to make my skin more even, the flush in my cheeks is covered and replaced with the rose colored blush, and you can't see the spot on my chin anymore! I also added a little mascara to make me look a little more awake.Overall it's a great product that makes me feel like I'm not actually wearing makeup. My favorite is actually the blush, because it's so pigmented without being obnoxiously bright. Sorry for these two pictures and the low quality. My camera has been a little wacky lately and hasn't wanted to cooperate with me, so I had to settle with iphone photos! Luminess is offering 20% off to my readers with the code 560788211 so if you're interested in trying Air Supremacy I would definitely recommend it! I have dry skin and it works well for me, but I'm honestly not sure how it would work for other skin types. Hope you're all having a great Thursday, I promise to be back on my posting schedule from now on! It's that time of year again...finals week. I'm unfortunately in the middle of my worst finals week ever, but I decided to make a post on what I carry in my bag during this week besides the boring notebooks, binders, papers, and my computer. I am a multiple to do list person. I have three different places where I keep my lists: my accomplish notepad, my planner, and random sticky notes that I leave in places that will hopefully remind me to do these things. 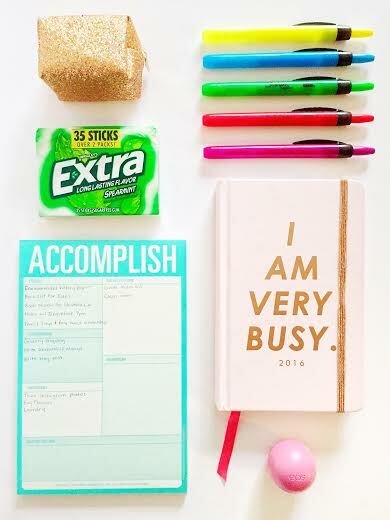 This week I have about a million things on my to do lists including study guides, final papers, and blog posts! I keep both my planner and my notepad with me just in case I forget to write something down or I need to double check when things are due. I also have my mini-mergency kit that has a number of items just in case I have a little emergency while I'm on campus for 8 hours. (I actually went one day last week where I was on campus for 13 hours!!) 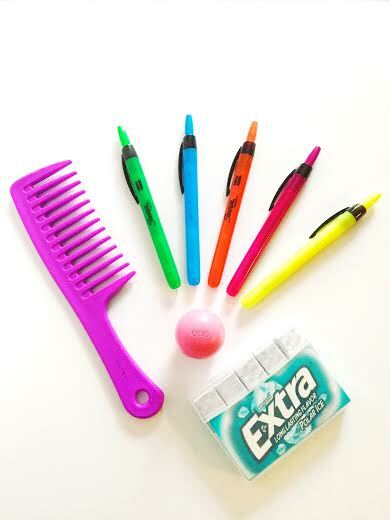 Then I bring my fun array of highlighters, a comb for when I feel like I look like I've been studying for too long, and some chapstick. 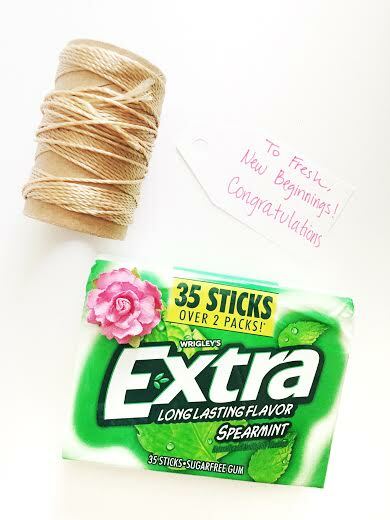 I also bring the new Extra® 35-stick pack in either Spearmint or Polar Ice® that I bought from Walgreens. The packages are recyclable and fit twice as much gum as regular packets! I bought two, but you can split the packages in half and keep one in your bag and one in your car, at your desk, or give it to a friend! 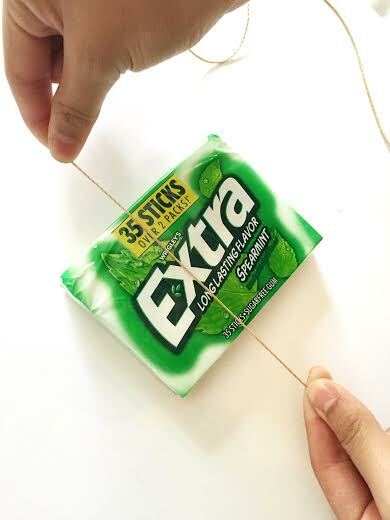 I use gum as a way to help me study. I've heard that if you chew gum while studying and then chew that same gum while taking the test it can improve memory. I have no idea if that's true or not, but it's worth trying! 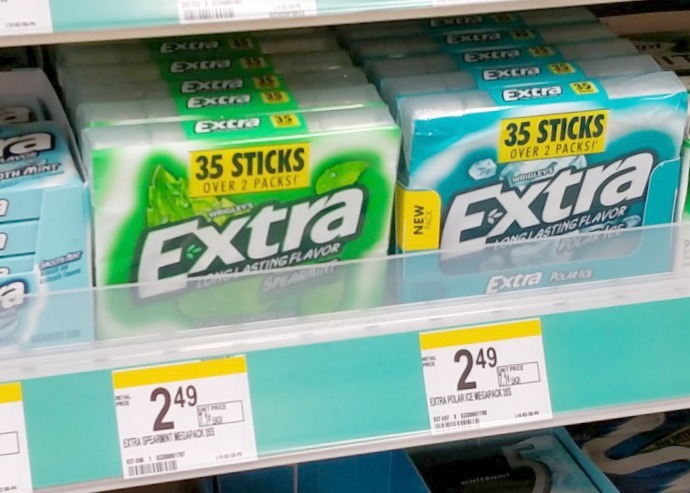 The 35 packs also make it easy to share some gum with your study friends as well, there's plenty to share! Along with finals, it's also the time for graduation! 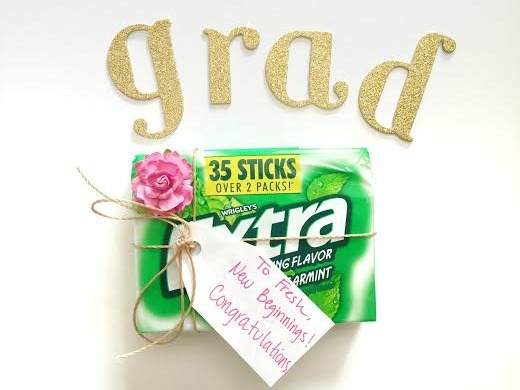 I'm not graduating this year, although I have many friends who are, so I thought it would be nice to give a little more thought to them by sending them off with a small gift! 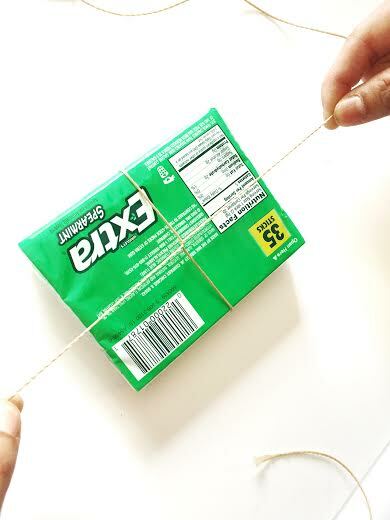 I just tied some twine around one of the packs of gum that I use, or well, my roommate Nicole tied the twine since she makes a mean bow, haha! And then added a little flower that I got from my local craft store and a cute punny note! Even Mowgli got in on the crafting! Hope you're all having a great finals week and aren't drowning in too much work! 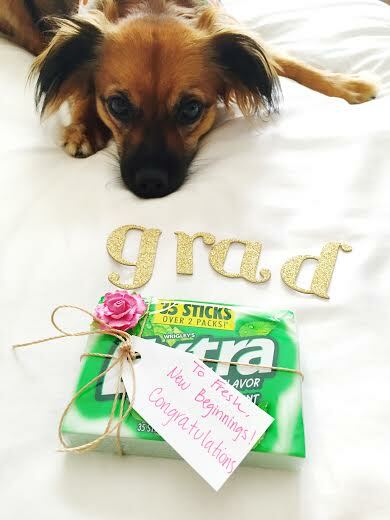 Go wish your grads a happy graduation too! Happy Monday everyone, Mother's Day is less than a week away! Unfortunately I won't be able to be with my mom on the special day since I'll still be in school, but for those of you that will make sure to make the best of it! You really don't know how much you love your parents until you can't see them all the time, seriously I'm only a few hours away (well 9, but still) and I miss them all the time. Mother's Day has always been pretty special ever since back in preschool and kindergarden where our school invited all the mothers to come spend time with us as we made them paper hats, I'll be the first one to admit that these hats were pretty horrendous, but my mom wore hers like a champ. 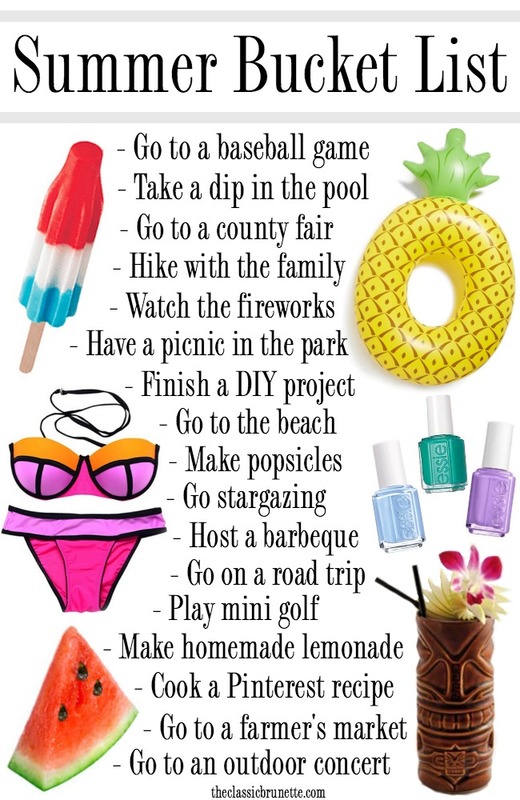 I've put together a few things that I think moms will enjoy, but here are a few other things that I didn't add to the collage that would be great gifts: A "book" of certificates for doing chores, spending quality time, cooking, etc. for your mom to use at any time, a mother daughter spa day, a book from her favorite author, flowers, mani/pedi with your mom, an edible arrangement, matching pajamas. 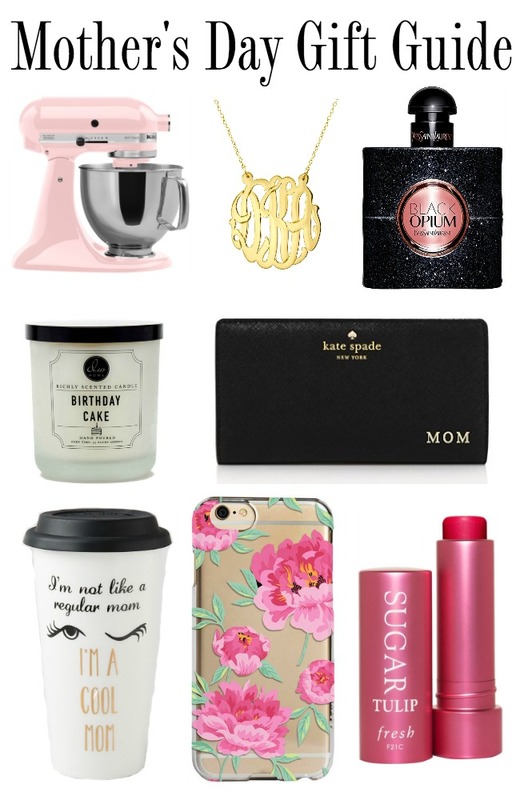 What's the best gift you've given your mom for Mother's Day?